From left, Suzanne Lillard and Verlene Farmer, who served many years in BCM work, along with Anthony Scott, Bailey and Hance Dilbeck. LANGSTON—Wednesday, Oct. 31 marked a historic day on a historic college campus in Oklahoma. 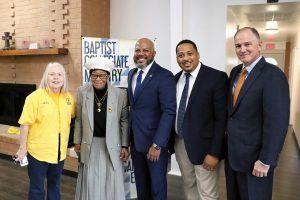 A group of Baptist faithful gathered at the newly remodeled Langston University Baptist Collegiate Ministry (BCM) Building for a special noonday and building dedication event. 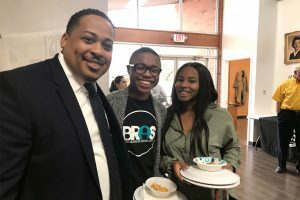 eaders with the Oklahoma Baptist State Convention (OBSC) and the Baptist General Convention of Oklahoma (BGCO) joined with Langston students and new and longtime leaders with Langston’s Baptist Student Union (BSU)/Baptist Collegiate Ministry (BCM). The OBSC is the state affiliate of the National Baptist Convention USA, a predominantly African American denomination. 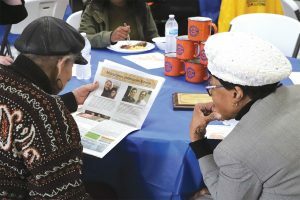 Farmer, right, and a friend look at the Nov. 1 edition of the Messenger, which featured a photo of Bailey and Farmer, top left column. Among those on hand for the special day was Verlene Farmer, longtime Langston BSU director. Farmer, now in her 80s, expressed thanks and praise to God for “all the good things He has done” through the campus ministry at Langston. Farmer’s international missions career was cut short due to a serious illness contracted from a reaction to anti-malaria medication, but God gave her a fruitful ministry of 26-plus years at the Langston BSU, where she also had a global impact. 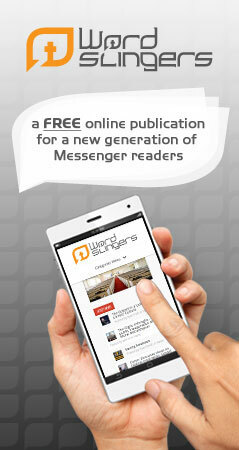 Bertholemew ‘Prophet’ Bailey shared how ‘ripe’ the ministry opportunities are at Langston. Farmer prayed that many students would come to the Langston BCM building for Bible study, to hear the Gospel, for fellowship and to be sent out. “Now send us around the world from here with the Good News of Your power… We give praises to Your Name Most High,” she said. Bertholemew “Prophet” Bailey addressed the gathering, citing the ripe ministry opportunities he sees on campus. Speaking at the brief program was Mike McDaniel, pastor of Forest Park, Northeast Missionary, who had a role on the search committee that hired Bailey as the incoming Langston BSU/BCM director. DeMarreo Felder, a Langston junior, said he was grateful for the renewed interest in the collegiate ministry. “I appreciate it. I love it,” he said. 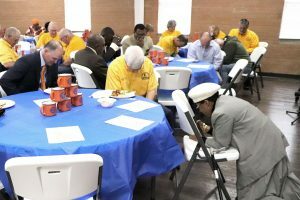 In addition to McDaniel, those who participated in the hiring process included several OSBC pastors, BCM State Director Cris Lowery and Chris Hager, director of missions for Central Association. Bailey began his ministry work in the summer. Don Williams reports on the work Disaster Relief volunteers and others did on the remodeling of the Langston BCM building. Until this most recent remodel, the last time the Langston BSU was renovated was 25 years ago. Trained and equipped volunteers of BGCO Disaster Relief (DR) spent countless hours during the hot summer days of July and into August—and many weeks thereafter—working on the building. From “Demolition Day” on July 20, in which aspects of the building were cleared, and old furnishings removed, to days of remodeling, the property has a brand-new look. Volunteers spent time replacing drywall, painting, cleaning, giving attention to ceilings, roofing and flooring, as well as renovating kitchen and bathroom spaces, all of which will enhance the property’s functionality and appearance. According to Don Williams, DR state director, more than 40 volunteers gave an aggregate of 1,000 volunteer hours toward the project. 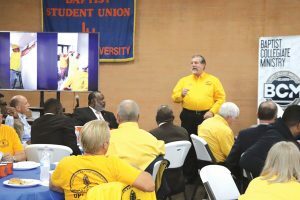 Through the Cooperative Program, Oklahoma Baptists invested approximately $40,000 in total cost for materials toward the renovation of the Baptist Collegiate Ministry Building at Langston University. Oklahoma Baptist DR, which participated in the renovation and also used the building project as a training opportunity for volunteers, helped provide the labor for the project at no cost. Farmer prayed on her knees, giving thanks for the partnership of the OBSC and the BGCO and asking God to bring students to the Langston BCM building. Following the noonday event, everyone gathered for a dedication ceremony that included Scripture and responsive readings and prayer. 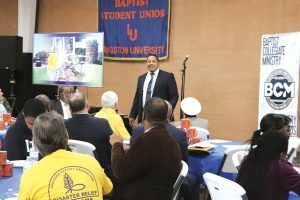 The BSU/BCM at Langston has a storied past and, with these latest improvements, an even more impressive potential for future ministry at this historic and well-known University.